“WHAT’S THE DIFFERENCE?” Is the usual remark we hear from some people when the Iglesia Ni Cristo (Church Of Christ) is introduced to them. It is perfectly sound and legitimate question to ask considering that there are many religions today vying against one another, and making claims and counterclaims that theirs is the best church to affiliate one’s self with. If one will only examine the doctrines upheld by the Iglesia Ni Cristo, it will be clear to them that all the beliefs of this Church can be found in the Bible. 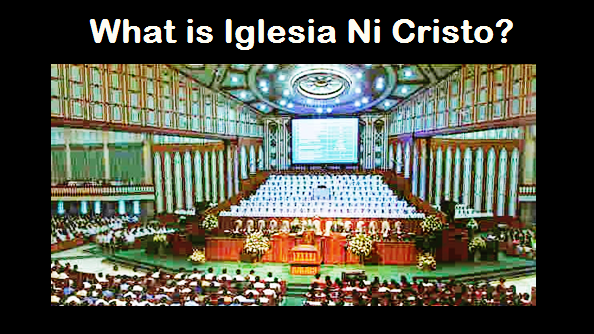 What are the basic teachings of the Bible upheld by the Iglesia Ni Cristo (Church of Christ)? How truly biblical the doctrines upheld by the Iglesia Ni Cristo? Because the Bible is the sole basis of our faith, we reject teachings not written in the Bible (e.g. Chrismas, Purgatory, Trinity, etc.) and other basis of faith (e.g. Catechism, Book of Mormons, Apocrypha, etc.). Thus, because we firmly uphold the biblical teaching that there is only one true God, the Father, and no one else besides Him, we reject the unbiblical teaching that there are three person in one God – that aside from God the father, there is God the Son and God the Holy Spirit. “As it is, you are determined to kill me, a man who has told you the truth that I heard from God. Abraham did not do such things.” (John 8:40 NIV, emphasis mine). Thus, we reject the teaching that Christ is God. "WE BELIEVE IN THE LORD JESUS CHRIST"
"WHY JESUS IS NOT GOD"
We believe that the Holy Spirit is the power (cf. Acts 1:8, TEV) sent by the Father in the name of Christ, to teach and remind His messengers of all things that Christ said (cf. Jn. 14:26), to help us in our weaknesses and infirmities (cf. Jn. 15:26; Rom. 8:26).The Holy Spirit strengthens, edifies, and comforts the Church of Christ (cf. Eph. 3:16-17; Jn. 14:26). And though the Holy Spirit is a spirit, but the Scriptures never refer to it as “God the Holy Spirit” because the Holy Spirit is not God but one of the spirits being sent by God (cf. Rev. 5:6). People must go to those sent by God (the messengers of the Lord) to learn His will. According to Apostle Paul: “And how can they preach unless they are sent…” (Rom. 10:15, NIV). According to the Lord Jesus Christ: “I tell you the truth, whoever accepts anyone I send accepts me; and whoever accepts me accepts the one who sent me” (John 13:20, NIV). We believe that the late Brother Felix Y. Manalo is God’s last messenger, the fulfillment of the biblical prophecies regarding the “Angel” (“messenger”) from the east (cf. Rev. 7:2-3) who would preached to God’s sons and daughters from the “ends of the earth” (cf. Is. 43:5-6; 41:9-10; 46:11). "BROTHER FELIX Y. MANALO: GOD'S LAST MESSENGER AND HIS MESSAGE"
The Iglesia Ni Cristo believe that since the ancient times, God has set apart his people to serve Him (cf. Ps. 4:3). People outside this election are not God’s people (I Pet. 2:9-10, TEV), not of Christ, and without hope and without God (cf. Eph. 2:12). “I am the door; if any one enters by me., he will be saved…” (John 10:9 RSV). Christ will not save anyone outside the Church Of Christ because it would be against the law of God that requires that sinners should pay for their own sin (cf. Dt. 24:16; Jn. 8:24;I Cor. 5:13). Man needs to receive the baptism commanded by Christ and preached by the apostles to be saved (cf. Mark 16:15-16), to become Christ’s disciple (cf. Mt. 28:19), and to receive the Holy Spirit (cf. Acts 2:38). The baptism commanded by Christ and preached by His apostles is through immersion (Rom. 6:4; Jn. 3:23; Acts 8:36-38). The Church Administration is from God (cf. Col. 1:25 NKJV) who He entrusted the message and the ministry of reconcilliation (cf. II Cor. 5:18-20). The Iglesia Ni Cristo believes that all those baptized in Christ should put on Christ (cf. Gal. 3:27).It is Christ who should live in them and no longer they themselves (cf. Gal. 2:20). We also believe that God prohibits the eating of blood (cf. Lev. 17:10; Acts 15:28). They are referring to the congregational worship services (cf. I Cor. 14:26 and 15). Thus, the members of the Church Of Christ value our congregational worship services. The Iglesia ni Cristo believes that members of the Church of Christ should observe the brotherhood Christ Himself established the brotherhood inside the Church of Christ (cf. Mt. 23:8; John 13:34-35). That is why members of the Church of Christ address one another as brother and sister. Thus, all the doctrines or beliefs upheld by the Iglesia Ni Cristo are truly wrutten in the Bible. The Iglesia Ni Cristo (Church of Christ) is truly biblical. I have read this and I am praying that you will grow more deeply in your faith in Christ our lord..
Let us look forward to Him our God, the God of love, lend us His Son to die and save on our behalf. May God's peace and love be with you always.. The enlighting words of God .must be read. So much to learn from this site, must share to every individual who seeks the true religion, the true Church, the whole truth and nothing but the truth that would lead to salvation. I love God’s Word and delight in its truth. Yet too often I find that after reading my Bible or hearing a sermon, the truth, so necessary to the well-being of my soul, can too easily slip away. The truth that had for a moment captured my attention and my affections can quietly fade amid the clutter and noise of the day. But one of the best way to remedy this is to read such inspiring posts...that have the power to reside in the mind, soul and heart for prolonged period of time. At the top is a link to click - How can I become a member?